'Immaculate' Peaceful, Centrally Located, Convenient ! Judge Place House is a character Cottage-Style Home, sitting amongst a protected Garry Oak Forest. Executive Style Home, Welcome long term monthly renters/fully furnished/all inclusive. It is a great location, Less than 5km from DT Victoria, we are 3km to the University of Victoria, Camosun College, and St. Michael's University, shopping, downtown Victoria, and have easy access to the airport or bus terminal. We are also walking distance to a public golf course, a heritage park, and a recreation centre. There is excellent public bus services to and from the University and downtown. It's also a great location to start your tour of Vancouver Island, the Gulf Islands, Washington State, Seattle, or Vancouver. daily/weekly/monthly/high season/low season rates available. Prices are based on 6 people staying, additional people are priced per person, per night. Accommodation for max 10 people with 5 bedrooms, 5 bathrooms, is 500.00 a night. All rates are in Canadian dollars. Deposit of one night's stay is required to confirm booking and preferred dates, unless the deposit is received, will the dates be booked, the final payment is due upon arrival. You can now pay through paypal, directly using your Credit Card. Or Square, Email money transfer, or Bank transfer. Cancellation, you will loose your first night's deposit. If you cancel 30 days prior to your arrival, there is no refund. Arrangements for another booking time is acceptable. There are no refunds. Need more space? The house has 3 suites, that are fully furnished and available for rental, although the main floor suite is the biggest, which can accommodate max 6 people, additional people are 18.00 per person per night, other units are ground level, providing, private entrances, fully self-contained units, comfortable for 2 -3 people max. All suites have excellent sound proofing, and come with private baths, kitchen's, laundry, an all amenities you would expect when renting. Housekeeping is available on a weekly basis. Attention large groups, family reunions, the house can accommodate up to 10 people comfortably with a total of 5 bedrooms and 4 bathrooms. Giving you, 2 king beds, and 3 queen beds, compromising of 2 suites, main floor suite and Garden level Suite. Extra space available out back, comprising of 2 self-contained cottages, Double and Queen beds, ensuite bathrooms and kitchenette. Keywords: House/3 bedroom/3 bathroom/extra accommodation, may be available. Executive type home, loaded with amenities you only find in a 5 star hotel. PET POLICY: The pet must be completely potty-trained,) no puppies allowed), and on a leash at all times when on the grounds. Dogs must not be incessant barkers, aggressive toward other dogs, and be on a regular flea control program. Dogs must also be crated if left alone in the home. The grounds are not set up for big dogs, and shared by other small well-behaved pets as well. Owners must administer poop management at all times. There is no pet damage deposit but, is an additional non-refundable pet fee 20.00 per pet per stay. I'm a self-employed business man, having several areas of expertise. Also worked for the Lt. Governor, Government House, here i do special events, catering, looking after high profile people when visiting Victoria. The recent visit of Royal family's of Japan and England. Also travel to Mexico, each winter, where i have a condo also for rent. I have been hosting and having people stay at the house for over 15 yrs now and enjoying the many different people that come and stay. I also host international and national students during the school season, from UVic and Camosun College. 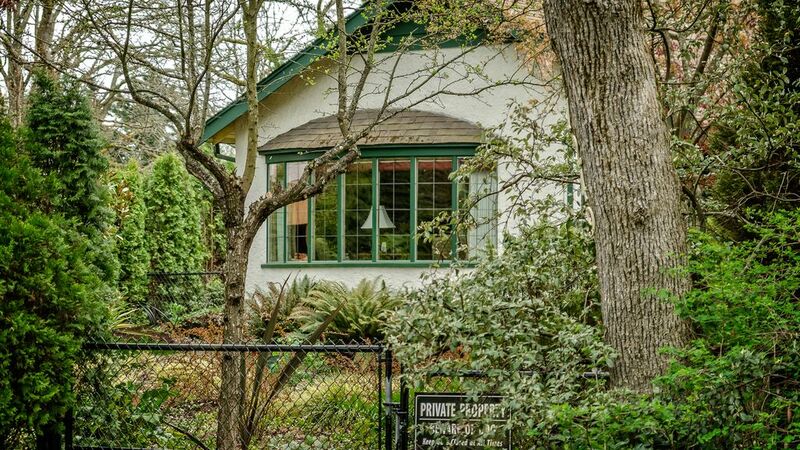 I love this area of Victoria, it is so convenient to everywhere in Victoria your only 8 mins from DT, Shopping, U-Vic, easy access to Airport, Main Land Ferries and Seattle, USA, Up island highway, yet the properties have big lot's and huge trees. Well Established Neighborhood. Heritage Park and Dead End Street, great location to walking trails. I really enjoy the peace and quiet of the area, traffic is local, south facing private back yard, huge trees provide privacy, well established neighborhood, centrally located, convenient, love the warm, spacious rooms of the house. Love the private Hydrotherapy Tub and Wet Steam Room, especially on a cold or wet day/night. House is laid out so that bedrooms are private from the rest of the house. Great for entertaining. Large windows,and big rooms. PLENTY OF STREET PARKING, ONLY ROOM FOR 2 CARS IN DRIVEWAY. Three Door Fridge/freezer/ice provided inquire with owner. Plus all Bedrooms have bar fridges. Very welcoming, comfortable atmosphere. Paul was very kind and helpful! Highly recommend! Paul is a great host, very kind and knowledgeable of the area. House was very comfortable and welcoming. We loved staying here. It is in a nice location in a neighborhood, and close to downtown. We had three couples and each of us had a bedroom with a bathroom in our room. The house is full of antiques but very comfortable. Paul has thought of everything you would need is in the house. Even a washer and dryer. He has a lovely backyard with comfortable seating, that you can enjoy. We highly recommend this home. We (3 couples) really enjoyed our stay in Victoria and at this property. Everything was clearly labeled & Paul was there to add personal instructions especially for the quirky kitchen smoke alarm. Everything was just as described. The only thing I could change is in the bathroom of Garry Oaks. It would be extremely helpful if there was some place in the shower to place soap, shampoo & wash cloth. As it was, we used the ledge of the wall molding to rest the soap & shampoo, & door handle for the wash cloth. A shorter person would not have had the ledge as an option. I can't speak to the other 2 bedrooms that were used during our visit. Parking was good & access to Netflix was a real plus. Xlnt stay. House and host was great! Quite location and beautifully decorated!!! A great location in a quiet neighborhood, we stayed in the main house and having 3 bedrooms ensuites was perfect. The kitchen was well stocked. We would definitely stay here again! Location of the home is within the East Saanich area of Victoria, or municipality of Saanich. This is located at the above location map, within less than 5km from DT Victoria and within 3km of U-Vic campus. The home is located within a protected Gary Oak/Douglas Fir forest. But within a short distance to the Ocean, Lakes, DT Victoria, Central to most attractions. You are approximately 15min from most driving distances within the greater Victoria Area. Shopping is within a 5min distance, from the house. THERE IS A PET FEE CHARGE, " THERE IS A CLEANING FEE CHARGE. 135.00 ON EVERY STAY. ALL PRICES ARE SUBJECT TO CHANGE WITHOUT NOTICE. INQUIRE ABOUT MONTHLY RATES DURING HIGH SEASON SUMMER. CHILDREN ARE WELCOME, BUT PARENTS ARE RESPONSIBLE FOR ANY DAMAGE THEY CAUSE. THE HOUSE IF FULL OF ANTIQUES, AND HEIRLOOM ITEMS.